Chandra observed Saturn before and then during a flare - Solar System Planets And Moons Section. Chandra observed Saturn before and then during a flare. Saturn Reflects X-Rays from the Sun. 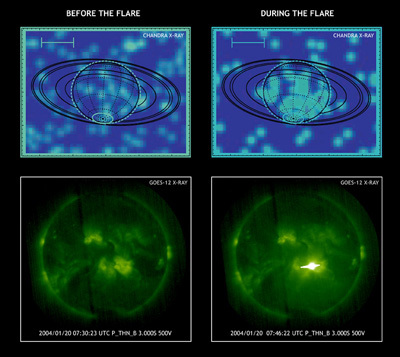 Based on new observations from the Chandra X-Ray Observatory, Saturn could act as a mirror to help determine when massive X-ray flares are going off on the Sun. Chandra observed Saturn before and then during a flare and could clearly see X-rays reflected back. A similar situation also happens with Jupiter, so scientists could use the two planets as remote sensing tools to monitor events on the opposite side of the Sun. Opportunity Still Working Itself Free from the Sand. NASA's Opportunity rover is still working its way free from the sand trap it ran into a few weeks ago. Since it began trying to escape the dune, Opportunity has only moved 30 cm (11 inches), but operators think it's just a matter of time before the rover finds more solid ground to grip onto. Once the rover gets free, it will turn around and analyze the sand dune to help figure out why this one was so sticky compared to the dozens it already drove over without any problem. A Bend in the Rings of saturn. This photograph of Saturn taken by Cassini shows its rings bending down just before they pass behind the planet. This is actually an optical effect caused by Saturn's atmosphere, which acts like a lens to refract the light. The image was obtained using Cassini's near-infrared filter which samples a wavelength that makes methane gas invisible, allowing the spacecraft to "see" through Saturn's atmosphere.